Hostel 'Cicada' is a small, new, nicely decorated, modern hostel. The hostel is in the center of town (Split), but in a quiet neighborhood, just 10 min walking to the old town, Dioklecians palace,to the stadium 'Poljud', where`s 'Ultra' organized. We are always trying to be as helpful as possible, but we give our guests privacy, so they can feel at home. Hostel Cicada is located in the center of town ( Split ), just 10 min. walk to the old city. The main street is 100 m from hostel, where our guests have supermarket, market with fruits and vegetables, coffee bar, hairdresser, masagge salon...On the other side (100m in 'Domovinskog rata' street) is one restaurant with Croatian food. The hostel consists of two rooms, one small with four beds, and the other bigger, with ten beds. We have two showers (male and female), and toilets. 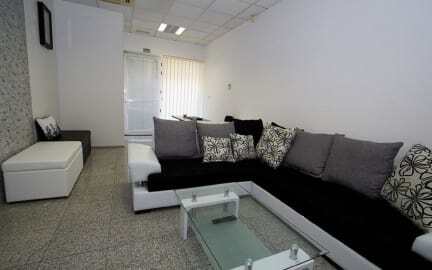 Our guests can relax in our living room, with cable TV, Wi-Fi internet, they can drink coffee, tea, some juice. The both rooms has air conditioner, and living room too. The payment on arrival in cash. Check out from 8:00 to 11:00. Reception opening times 08:00 - 00:00. Taxes not included - occupancy tax 8 HRK per person per night. Staff cordiale e disponibile. Ma l ostello Non è così in centro da come dicono molte delle recensione. Si trova su una lunga salita, almeno 15 minuti a piedi dal centro città.